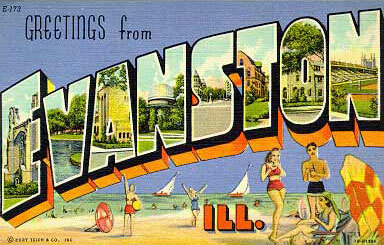 My coat: – Greetings from Evanston, Ill.
My winter coat is big and green. It has other qualities, but Enron probably has a good dental plan too. The problem about the jacket is that it makes me look like a Christmas tree. Skinny trunk surrounded by a whole bunch of green. After making the mistake of admitting my self-consciousness, Lindsay now shows how much she cares by singing “O Christmas Tree” when I wear the jacket. I think that’s why I always comment on people’s red shoes. If I was wearing those shoes, then I’d only be a white hat away from having my halls decked. “O Christmas Tree” is one of those songs that people know the first verse of and then mumble the rest, usually because everyone seems to be saying something different. Apparently they are.